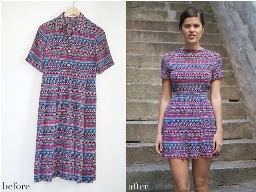 Geneva from A Pair & A Spare share a fun refashion before & after with a thrift store find. A droopy sack of a dress gets turned into mini-dress cuteness. The DIY includes turning the dress around, fitting it to her shape, and cutting the skirt short. What a difference! She shares a quick telling how she did it. Get the DIY how-to. Love the fabric and design. And you reused the collar. Very creative.